Building construction and operations can have extensive direct and indirect impacts on the environment, society, and economy, which are commonly referred to as the 3 P’s (‘People’, ‘Planet’, ‘Pocketbook’). The field of sustainable design seeks to balance the needs of these areas by using an integrated approach to create win-win-win design solutions. The main objectives of sustainable design are to reduce, or completely avoid, depletion of critical resources like energy, water, and raw materials; prevent environmental degradation caused by facilities and infrastructure throughout their life cycle; and create built environments that are livable, comfortable, safe, and productive. 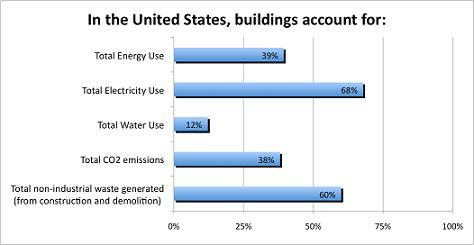 Buildings use resources (energy, water, raw materials, and etc. ), generate waste (occupant, construction and demolition), and emit potentially harmful atmospheric emissions. Building owners, designers, and builders face a unique challenge to meet demands for new and renovated facilities that are accessible, secure, healthy, and productive while minimizing their impact on society, the environment, and the economy. Ideally, building designs should result in net positive benefits to all three areas. In addition to including sustainable design concepts in new construction, sustainable design advocates commonly encourage retrofitting existing buildings rather than building anew. Retrofitting an existing building can often be more cost-effective than building a new facility. Designing major renovations and retrofits for existing buildings to include sustainable design attributes reduces operation costs and environmental impacts, and can increase building resiliency. The embodied energy of the existing building, a term expressing the cost of resources in both human labor and materials consumed during the building’s construction and use, are squandered when the building is allowed to decay or be demolished. Building resiliency is the capacity of a building to continue to function and operate under extreme conditions, such as (but not limited to) extreme temperatures, sea level rise, natural disasters, etc. As the built environment faces the impending effects of global climate change, building owners, designers, and builders can design facilities to optimize building resiliency. Building adaptability is the capacity of a building to be used for multiple uses and in multiple ways over the life of the building. For example, designing a building with movable walls/partitions allow for different users to change the space. Additionally, using sustainable design allows for a building to adapt to different environments and conditions.